and the natural woods to ground our nature-based designs and colours. What is the Serenity Palette? The palette was designed with Scandinavian sensibility and sustainability in mind. Our homes are our sanctuary, our place of serenity. Tap into your inner peace in your living or work space with the simplicity of colour. Glamour is a delicate, minimalistic tone with lavender notes. Malachite is a slate stone colour with nature balanced textures. White Design is a fresh white that is perfect for trim. 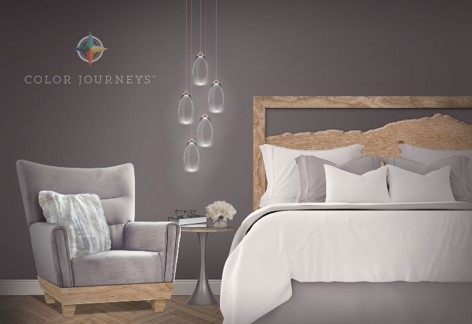 The Color Journeys Palette also includes trending wood stains that help to create a grounding effect in your space. Pickled Oak reveals cool tones & textures and a sense of minimalism and Dark Walnut adds a sense of luxury and warmth into your home. “The palette takes cues from our natural surroundings. Rich, royal Malachite can fade into the soft lilac-grey of Glamour or morph into Quartzite. 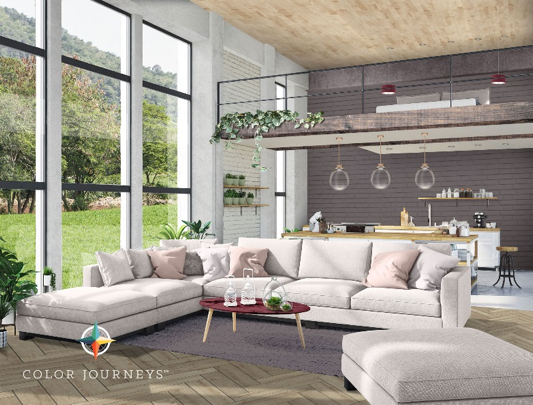 Indulge yourself in nature and let the 2018 palette of the year set the tone of your home or work space- this palette is that flexible.” – Jennie Roarty, Associate Brand Manager General Paints.